What cool things could you create with this Solar Pocket Kit? 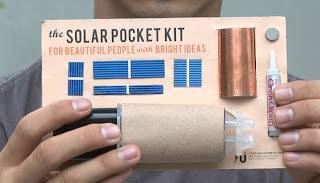 Have you ever bought a solar powered gadget only to have it fail in about a year? We have dozens of defunct solar yard lights that worked well for a few weeks or month, but are now just junk. Either the electronics have rusted, the epoxy coating the solar panel has yellowed and clouded over or the rechargeable batteries have failed. The epoxy coating has clouded over. and being in the sun. Unfortunately, very little has changed in the past ten years on how small solar panels (the type to power a few LEDs on a walkway light) except that they are cheaper, both in their cost and their quality. They are made in Chinese sweat shops and soldered by hand thus having huge failure rates. The factories end up throwing away a lot of broken Silicon cells. Two young inventors think they can change that and need your help. If Shawn and Alex are successful with their Solar Pocket Factory, they will revolutionize the micro-solar industry, reducing the cost, reducing the waste (both in the factories and post consumer failures) and make solar even more accessible. Maybe they will even destroy the disposable battery. p.s.If you are interested in bigger scale solar, like the type you would find on a house instead of a playing card, check out our solar series Going for Solar and Solar Should Be Simple. Next Post: Why Should I Be Concerned About GMOs? Thanks for this great post! I totally agree something needs to change to improve the way small solar panels are made. I just bought a large stock of solar tops since I make/sell solar lanterns and over half of them had dead batteries. The manufacturer sent me a box of new batteries but that’s still a ton of waste. Hopefully it does improve!